The Bortz Brothers, Joe & Mike Bortz are well remembered for their theme restaurants in Chicagoland called Doctor Jazz Ice Cream Parlors and Sally’s Stage. In the early seventies Joe, a biochemist and his brother Mike Bortz, a Chicagoland school teacher, started with their first Doctor Jazz 1609 W. Montrose Ave. (& Ashland Ave.) Chicago and their second Doctor Jazz location at 913 ½ Chicago Ave. Main St. (& Chicago Ave.), Evanston. These were the first themed restaurants even before the famous Rich Melman started his first themed restaurant in Evanston, “Fritz That’s It”. The Doctor Jazz Ice Cream Parlor booths were from original ice cream parlors that had been boarded up in Chicago. Doctor Jazz was noted for the peanut butter shakes and silent movies every hour on the hour and the antique amusement games from Riverview Park like mutescopes, ‘diggers’, the world’s largest nickelodeon strike machines and even electric shock machines. Doctor Jazz was also famous for its non-smoking policy and if you lit up a cigarette the smoke would eventually hit the smoke detectors setting off fans and sirens. Every customer would look to see who the culprit was that was smoking and of course the pressure from the patrons would cause the customer to immediately put out his cigarette. Doctor Jazz fame for discouraging smoking became so well known that in 1975 Doctor Jazz Ice Cream Parlor received the first award ever from the American Cancer Society given to a business for helping to fight cancer. Most of the employees from Doctor Jazz Ice Cream Parlors were local kids from the area ranging in age from 13 through 21 years. Doctor Jazz became the weekend spot for the parents to bring their children but the ice cream parlor was also open until midnight on the weekends and became a very popular evening destination. It was not uncommon for the Montrose location on a Friday or Saturday night with only 45 seats to serve 300 people in the evening. On a Sunday Doctor Jazz Ice Cream Parlor with a continuous line would do 300-400 people during the course of the day and the evening. Long will be remembered such workers as manager Al Strong, assistant manager Paul Baret, manager Paul Peterlin and his good buddy Eric along with the other employees. Hopefully this website will have other former employees writing into the blog. We would love to hear from former employees and customers who have fond memories of their days at Doctor Jazz. Doctor Jazz in Evanston was the second Doctor Jazz Ice Cream Parlor located on Chicago Ave & Main St., was much bigger and sat up to 95 people. It too was a popular nightspot for the north shore for the young set and the adults. In Evanston several of the competing Illinois congressman actually did promotional campaigns out of Doctor Jazz Ice Cream Parlors. If you were ever a customer and have any thoughts or comments please bring these up on the Doctor Jazz Ice Cream Parlor blog. If you have any pictures please send those in as we would be happy to post them. WhirlyBall is there now, which doesn’t entirely disappoint the Bortz brothers, who owned Sally’s. WhirlyBall, the game that combines bumper cars, jai alai and basketball, is fun. Sally’s Stage was fun. But different. Its origins were in the Dr. Jazz ice cream parlor on Montrose Avenue in Chicago, which Joe Bortz bought in the early 1970s. Dr. Jazz had a nickelodeon. It ran silent movies and displayed antiques. Bortz enhanced the theme, bringing in a Charlie Chaplin impersonator and adding other quirks. The concept caught fire and Mike Bortz, Joe’s brother, quit his teaching job to work as the Dr. Jazz accountant. The brothers opened a second Dr. Jazz in Evanston, which also became very popular and gave Mike Bortz an idea: If they could serve alcohol, they could boost profits. But an alcohol/ice cream parlor lacked a certain gastronomic congruity. Joe Bortz had another idea. He had heard about pizza parlors featuring pipe organs and thought they could blend that concept with a few wacky twists. They found a theater pipe organ in Fond du Lac, Wis., and a former barbecue ribs joint, Sally’s, on Western Avenue a half-block south of Devon Avenue in Chicago. The name wasn’t as catchy as they would have preferred, but the brothers really liked the giant vertical neon sign outside the building. 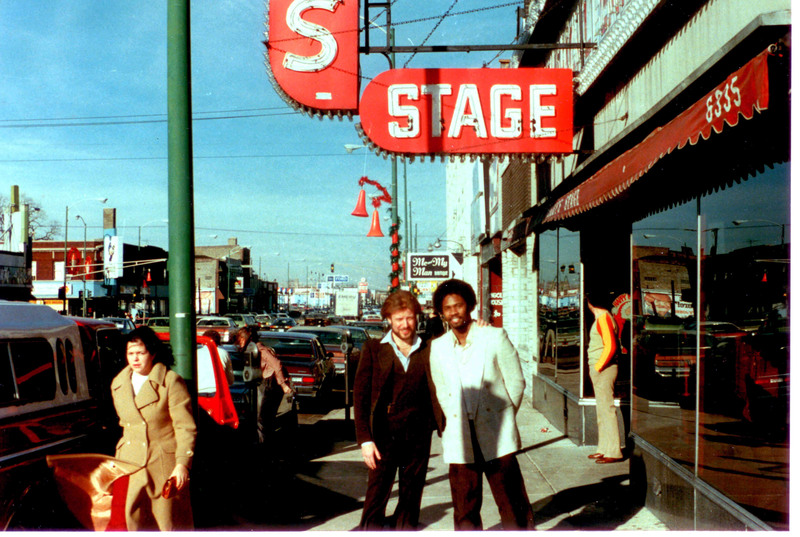 Sally’s Stage was born in early 1977. Two years later, buoyed by the wild success of Sally’s, the Bortz brothers opened another, about 25 miles southwest, at 800 E. Roosevelt Rd. in Lombard. It, too, drew crowds, including Kuhs, who recalled how fun the place was for her as a 9-year-old. To describe the restaurants’ appeal is a bit like trying to capture the appeal of vaudeville, the nearly extinct entertainment form that features a stream of comics, dancers, singers, magicians, even acrobats. Sally’s was that, for sure, and something that defied categorization. Sally’s hostesses wore roller skates. The theater pipe organ would emerge from a pit, and the organist would lead a singalong to words posted on a drop-down screen or accompany a silent movie. The waitresses would hop onstage to sing. One night a week was amateur night, when anyone with a semblance of talent — even if that talent existed only in the mind of the performer — could take the stage. That threw the doors open to a fairly broad swath of human creativity. One man demonstrated how to place a washer in a faucet. Another stout gentleman performed on his musical navel. A third played his teeth. Regular entertainers included a shabby man who crooned a beautiful version of “Blue Moon,” and “The Chicken Man,” who would sound impressions of animals. The biggest star to develop chops at Sally’s was comic Judy Tenuta. Rumba went on to become a successful ventriloquist, comic and Hollywood impersonator. And Mike Bortz contends that Chloe Webb, who those of a certain cinematic preference may recall played punk rocker Sid Vicious’ girlfriend in the 1986 epic “Sid & Nancy,” was a performing waitress at Sally’s Chicago Stage. Families could enjoy pizza, sandwiches, soups, salads and similar fare at reasonable prices. The Bortz brothers, ever the innovators, were always tweaking the concept. In 1980, when the film “Urban Cowboy” created a cowboy craze, both Sally’s Stages brought mechanical bulls and held Western nights. 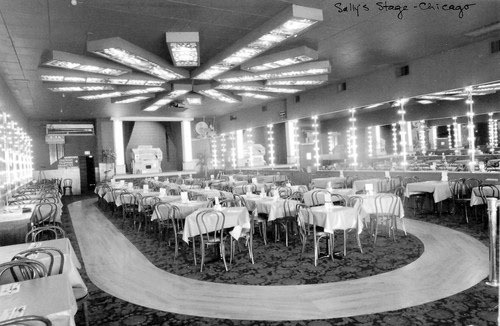 In the early 1980s, the Bortz brothers converted the Chicago Sally’s to a robot-themed restaurant, where mechanical devices delivered food to tables. That concept lasted about a year, Joe Bortz said, then the brothers sold the restaurant to a businessman who remodeled and emphasized the pipe organ.